Heat the oil in a large saute pan or wok, add the crushed red pepper flakes and saute until peppers are slightly browned, do not let them burn. Add the onions, garlic and chipotle pepper in adobe sauce; saute until onions are translucent. 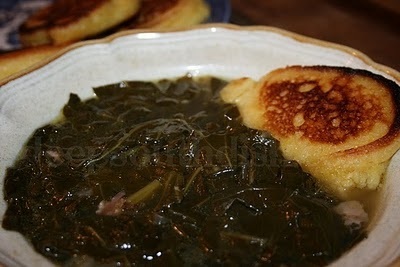 Add the collards and all remaining ingredients, carefully mix until all ingredients are well incorporated. Cover, bring to a gentle boil, reduce heat to low and cook 30 minutes stirring occasionally. Taste, season with additional salt and pepper as needed; sprinkle with dried pepper flakes, if desired. 50 Ways to Spice Up Your Life! Ward off Colds and Flu with "The Lemonade"